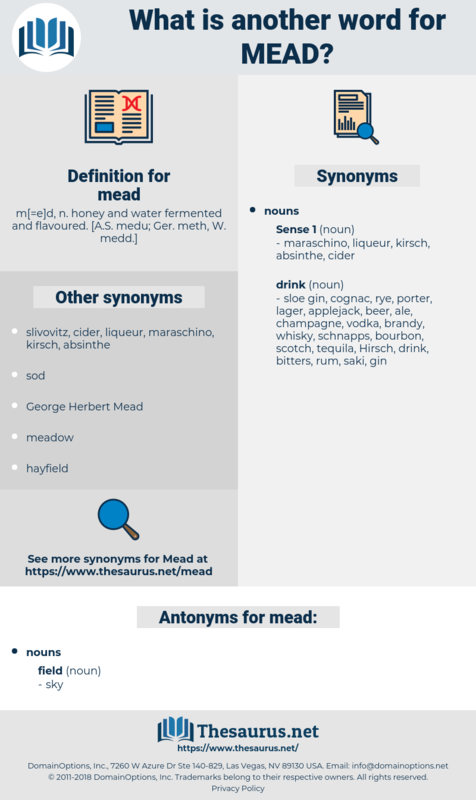 What is another word for mead? Mead told me the chief wanted to see me, so we started for his office. He engaged John Mead Howells to prepare some preliminary plans. 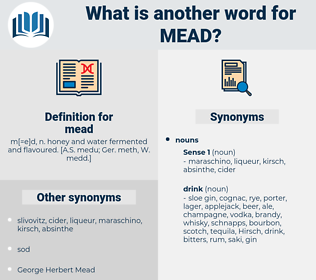 momotidae, muhammad, mentha, maenad, Mutawa, meed, minutia, moat, monet, mandate, maimed, maidhood, mediated, midday, mut, moot, memento, mood, manhunt, mahound, montia, monod, monnet, meade, mud, mate, mantua, manteidae, mod, Mahdi, mined, Mothy, minute, manidae, mitt, mammoth, mayday, manhood, madia, mamet, mode, midi, mit, matthew, minuend, moneyed, moated, manihot, muddied, manda, maidu, meet, may day, matted, mountie, made, miniate, mantidae, Mohammad, mohammed, matai, middy, month, mote, mot, mind, mantid, minuet, moth, minded, manat, moody, mayweed, mint, mahout, mounted, moiety, meditate, manumit, mennonite, md, man-made, midway, mott, meted out, moment, math, mimidae, minuit, mutt, Mete, manet, motet, mat, meaty, mated, mend, monad, momot, myth, maid, mouth, MDI, maund, mete out, manned, monday, minnewit, menotti, myoid, mammutidae, matte, mediety, meadow, mammut, mount, mahomet, metadata, mound, manatee, med, manteodea, maundy, manta, mad, medea, matt, muted, motto, monte, monody, method, munda, mt, monied, mite, meat, mediate, monument, muddy, meth, mute, matey, mid, mande, mutate.